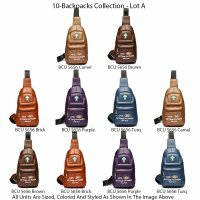 The lot will consist of 10 backpack exactly in the styles and colors shown in the picture. 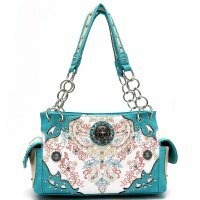 This limited-time economy handbag lot features 10 Fashion Crossbody bags --- styled and colored as depicted in the image above. 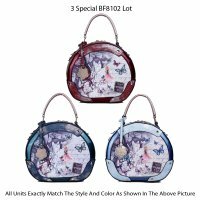 This limited-time economy handbag lot features 10 designer inspired handbags --- styled and colored as depicted in the image above. 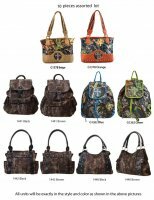 This limited-time economy handbag lot features 10 Fashion handbags --- styled and colored as depicted in the image above. 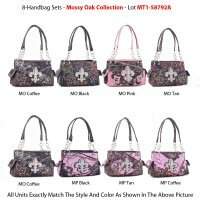 This lot will consists of 10 handbags exactly in the style and color shown on the pictures. 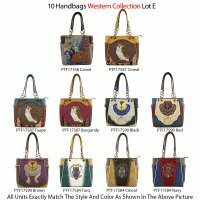 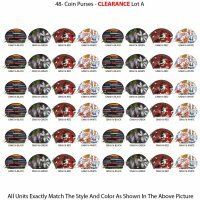 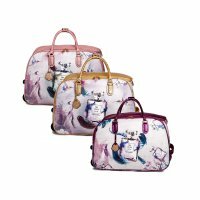 This premium handbag lot contains 10 Western Montana West Collection Handbags Lot -- styled and colored as depicted by the image above. 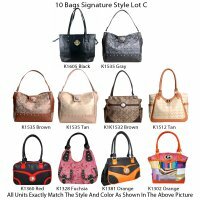 The lot will consist of 10 handbags exactly in the styles and colors shown in the picture. 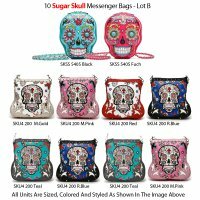 You pay an average of $9.50 per bag before shipping. 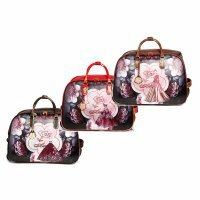 This 10-bag lot features premium handbags styled and colored as depicted in the image above. 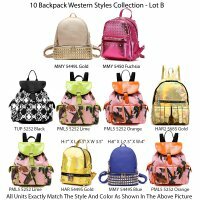 This limited-time economy Handbags lot features 10 designer inspired purses --- styled and colored as depicted in the image above. 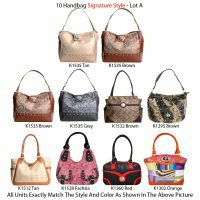 The lot will consist of 10 handbags exactly in the styles and colors shown in the picture. 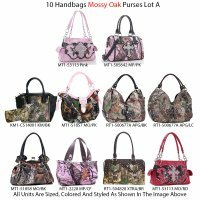 The lot will consist of 10 Handbags Holiday Season Collection exactly in the styles and colors shown in the picture. 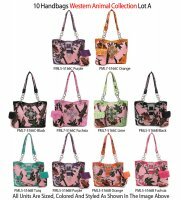 This limited-time economy handbag lot features 10 Fashion handbag & Wallet Sets --- styled and colored as depicted in the image above. 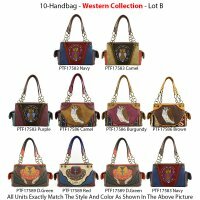 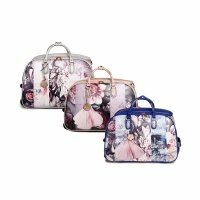 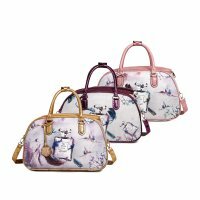 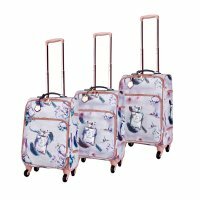 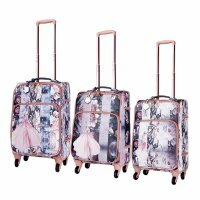 This premium handbag lot contains 10 Fashion purse with matching wallet sets -- styled and colored as depicted by the image above. 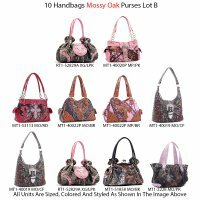 The lot will consist of 10 handbag exactly in the styles and colors shown in the picture. 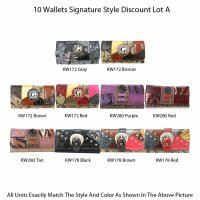 The lot will consist of 10 wallets exactly in the styles and colors shown in the picture. 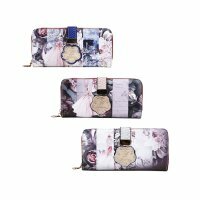 You pay an average of $4.5 per wallet before shipping. 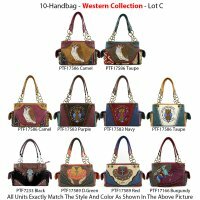 This premium handbag lot contains 10 Western purse with matching wallet sets -- styled and colored as depicted by the image above. 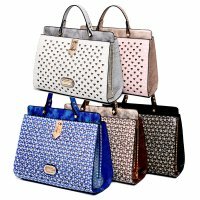 You will receive an exact handbag of each color or variation as depicted by the image above. 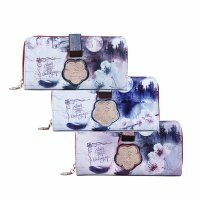 This limited-time economy women's wallet lot features 10 designer inspired clutches --- styled and colored as depicted in the image above. 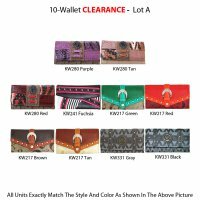 The lot will consist of 10 wallets exactly in the styles and colors shown in the picture. 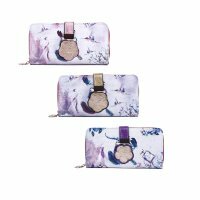 You pay an average of $3.95 per wallet before shipping. 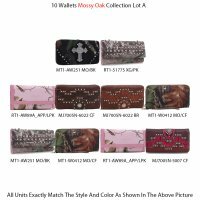 The lot will consist of 10 wallets exactly in the styles and colors shown in the picture. 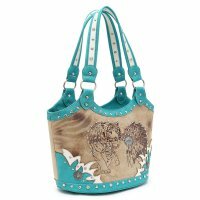 This premium handbag lot contains 10 Western Fringe -- styled and colored as depicted by the image above. 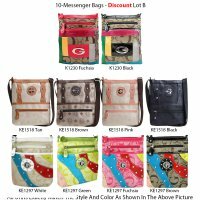 You will receive 10 messenger bags as depicted in the image above. 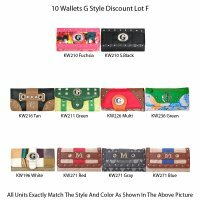 This limited-time economy women's wallet lot features 12 designer inspired clutches --- styled and colored as depicted in the image above. 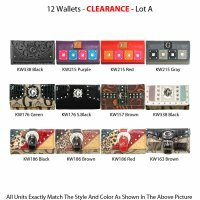 The lot will consist of 12 wallets exactly in the styles and colors shown in the picture. 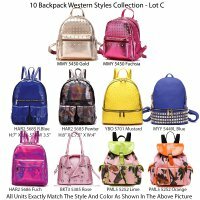 You pay an average of $4.125 per wallet before shipping. 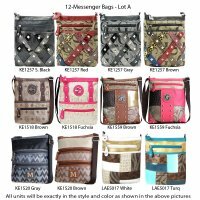 This discount lot will consists of 12 messenger/cross-body bags exactly in the style and color shown on the pictures. 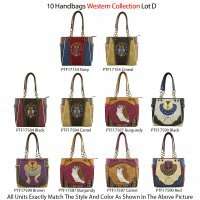 This limited-time economy handbag lot features 16 designer inspired handbags --- styled and colored as depicted in the image above. 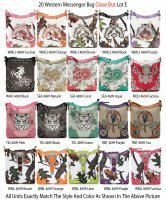 This limited-time economy women's wallet lot features 16 designer inspired clutches --- styled and colored as depicted in the image above. 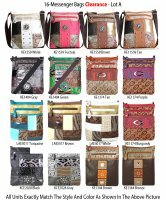 The lot will consist of 20 wallets exactly in the styles and colors shown in the picture. 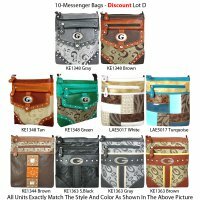 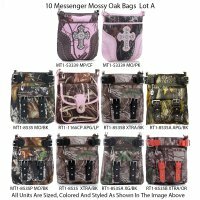 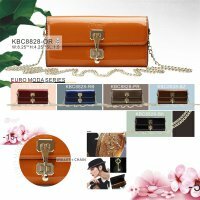 This discount lot will consists of 20 messenger/cross-body bag exactly in the style and color shown on the pictures. 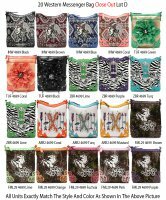 This limited-time economy women's wallet lot features 20 designer inspired clutches --- styled and colored as depicted in the image above. 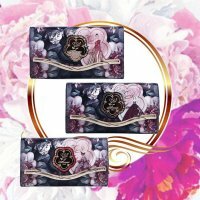 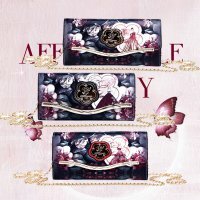 The lot will consists of 20 wallets exactly in the style and color shown on the pictures. 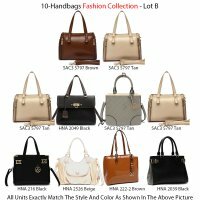 You paid an average of $3.75 per wallet before shipping. 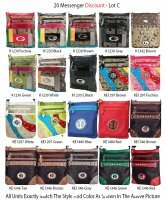 The lot will consist of 20 wallets exactly in the styles and colors shown in the picture. 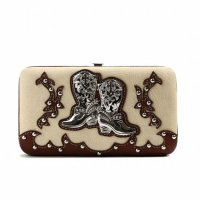 You pay an average of $3.825 per wallet before shipping. 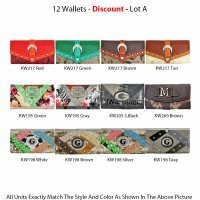 The lot will consist of 20 wallets exactly in the styles and colors shown in the picture. 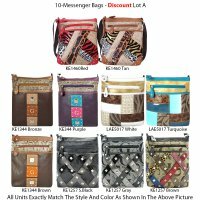 You pay an average of $3.95 per wallet before shipping. 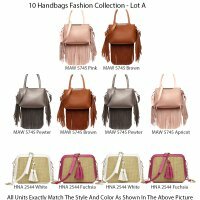 The lot will consist of 20 handbags exactly in the styles and colors shown in the picture. 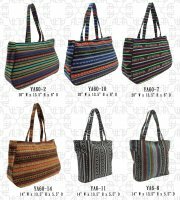 The lot will consists of 20 messenger/cross-body bags exactly in the style and color shown on the pictures.